UK TEXT : Long time I didn’t post some music here. 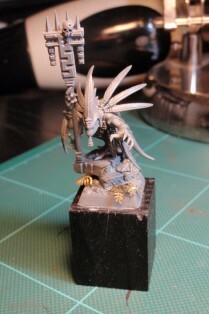 Just the feeling of the moment, I need motivation for this damned Skink priest !!! About him, daily pics will be upload soon. And after that… it’ll be a big project I have in my mind since a lonnngggg time ! TEXTE FR : Cela faut un sacré moment que je n’ai rien posté de musical par ici. C’est surtout le feeling du moment, besoin de motivation pour finir ce satané prêtre Skink !!! D’ailleurs, des photos quotidiennes devraient poindre le bout de leur nez rapidement. Et après ça… un gros projet perso que j’ai en tête depuis un bon moment ! This is a chronicle published in the US Ravage #8. At the time, only rumours of french and Spanish GD cancellation were current. Since this time, these ones have been officially cancelled. And for 2014, we’re are actually speaking about the only survival of UK Games Day. Times are changing, but these are the lines I wrote when the Golden Demon still existed in different european countries. 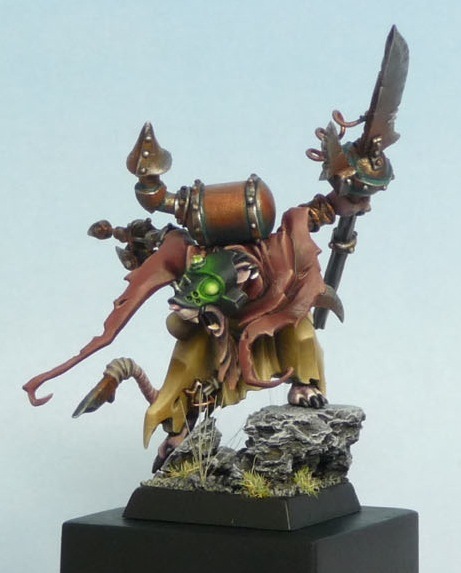 I am often asked the question ‘‘How do I win a Golden Demon?’’ Systematically, it returns me to years back, while I was also looking for an answer. 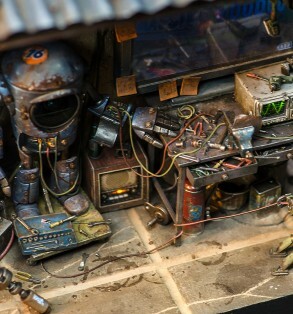 Our microcosm consists of many things, ranging from the introduction of new brands, new gaming systems, to the figures themselves. But whether you’re a painter or a player, contests and tournaments are not unknown to us, either. In painting, it is clear that the Golden Demon (organized by Games Workshop) remains the benchmark competition for a large majority in the industry. But why has it become so popular? The answer is simple, the British firm has a major advantage that its competitors do not have for the most part: White Dwarf. Once the results of Games Day England appeared in the magazine, a desire born in the heart of all his readers to see that its published figures, seen by the rest of the world and therefore recognized and receive a statuette that would become legendary. 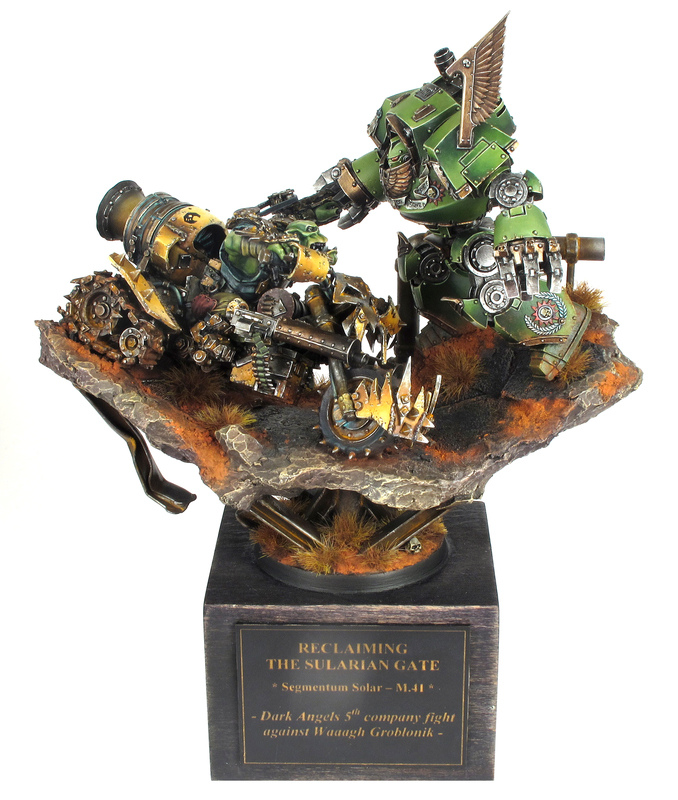 Yet, while the contest has spread across the world with U.S. and European editions, and the level of competition is high, I can tell you that winning a Golden Demon trophy is not so difficult. With hard work, a lot of questioning, discussion and submitting its facets to criticism, it can come together very quickly. 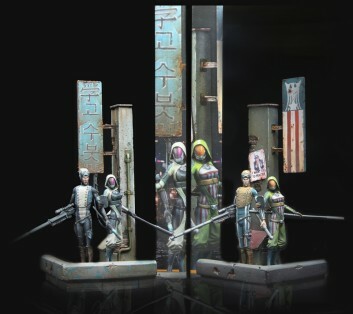 As a teenager, I really wanted to simply buy one of these statues. I never really tried to get beyond the level of attention that I gave to my armies. After a year of intensive practice some more, I finally get Bronze in 2004, during the German edition of the competition. Today, I have lost count of my friends and relatives in the community who have also achieved a win; each for the reasons mentioned above, and on average after four years of work. 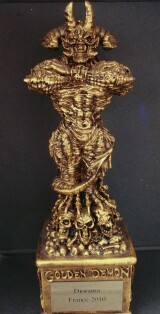 With an average of twelve categories, three awards each, and international editions, over 250 trophies are awarded each year. Knowing that nine years have passed since my first Demon, it means roughly 2,300 statuettes have been distributed worldwide. Finally, there are several hundreds or thousands of painters who have a piece of resin on a shelf. Althought, Golden Demon existed since the ‘80s (even if at the time there were not as many categories or editions as there are today), meaning that the exact number is much more higher. Finally, many find the level of the competition extremely high – and that was my case – we should still rationalize everything. The general level present among the ten finalists eligible to the podium in a category rarely exceeds the “confirmed” level in Open competition. Even if there are several masterpieces each years. While this level is not exactly easy to achieve, with continued practice, reading tutorials, and submitting his work, it is a really practical level attainable for everyone. And I swear to you, as soon as your internal artistic machine is running, the reflexes are acquired, and progress towards even greater results becomes obvious. It is therefore not surprising that at the end of two years of studious painting, and as long as we travel to two (or maybe even three!) competitions, a Bronze (or more!) will eventually land in your hands. That’s all the best I wish for you! But that’s not all. There is often a second question after the first. ”What difference does it make to win a Golden Demon?” Well, honestly, it does nothing; it is a personal pleasure and point of confidence. It becomes a known fact to those who are interested. And that’s all. You do not become rich anyway. This is not because you earn a hundred Demons or more, that a guy will comes knocking on your door. I have won thirty-three Golden Demon, and I still do not paint figurines as my full-time profession (for the moment, even if it’s changing). But whether you have a Demon or not, so long as you announce your availability for orders, and do a good job, then everything happens in the same way. Having a Demon can certainly act as a good guarantee of quality in a painter. And yet, because of the number of trophies distributed and variations in the difficulty of their varieties, it is not always true. It is not the number of trophies that matters; it is your overall work. I know the offers that are made to me of my accomplishments, rather than the trophies I have accumulated. 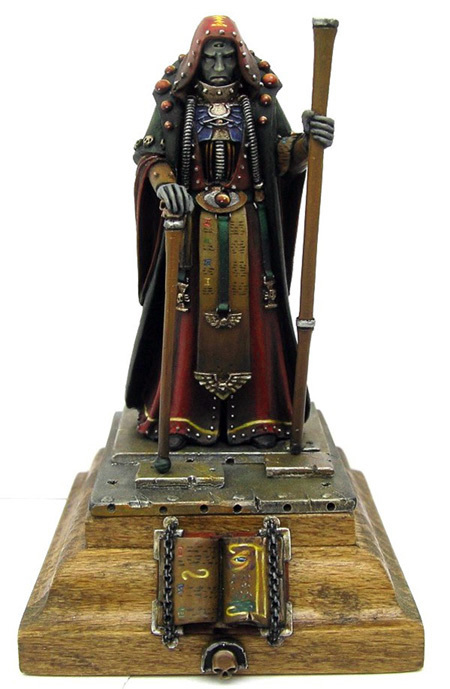 Winning a Golden Demon will therefore never bring you fame, dates and cult worshipers ready to bring about the end of time … though … ! However, one thing is unchangeable. Winner or not, participating in a competition, you must give the best of yourself. In seeking to improve yourself, the results will inevitably lead you to be proud of your efforts, your progress, and the progression of your figures. This is where I personally enjoy participating in Golden Demon. In addition to the deadline, which forces to finish a project in a given time, I was always forced to improve upon my skills and be happy with the progress. The notion of competition pushes personal fulfillment. Of course, when you participate in a competition, you try to win a prize. The win WILL cause some immediate gratification, of course. So if you want to win a Demon (I really wish you luck! ), in addition to all the hard work you’ll see along the way, and this is where the most important: having more fun to paint your miniatures and try new things is paramount! That being said, with rumors of more Games Day cancellations and Golden Demons around the world (France, Spain, Australia …) for 2013 (and now 2014 ), that leaves us plenty of time to work between competitions! UK TEXT : This was a very, very hard choice. In fact it’s pretty irrelevant this year to make such a post, as there was a lot of brilliant miniatures. 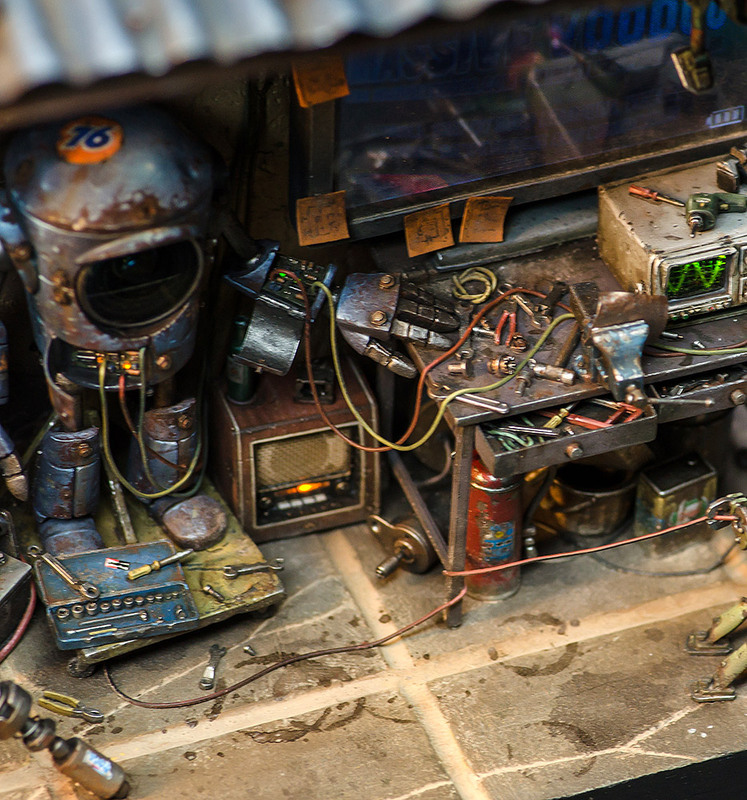 All this five miniatures are really awesome. They all are above my skills, and in a very different approach and style. To make a choice, the thing is to focus on little faults here and there, and try to forget all the good and crazy parts for a moment. 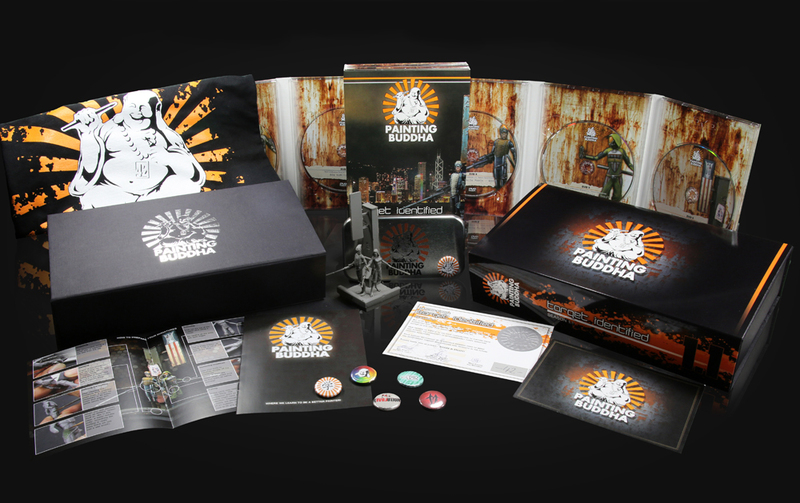 - The Walking Dead : All the scene is very clean and very easy to read. A pleasure on that. After it’s the airbrush aspect that kind of disturb me on some place. Like on the grey zombie. Also the manner to hide the connection foot of the character/car with some bricks. Very lucky to have some bricks here but not elsewhere on the diorama. 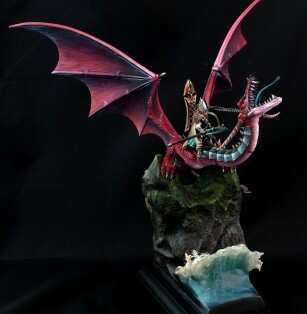 - The High Elf Lord : In fact it’s mostly the base, that is a bit too simple in kind of textures for my personnal taste, and with a water too colorful. And some very tiny parts of the painting that are a bit simple (like the black handle of the axe), but I know how hard it’s to make a such big miniature. And fore sure, Raffa did a stunning work on it ! - Giu’s : behind the incredible amount of work that represents this project, and the insane idea of such a piece, the scene is pretty frozen, and in details, the painting is good, but not extraordinarry. Or at least, not the best of Raffa. 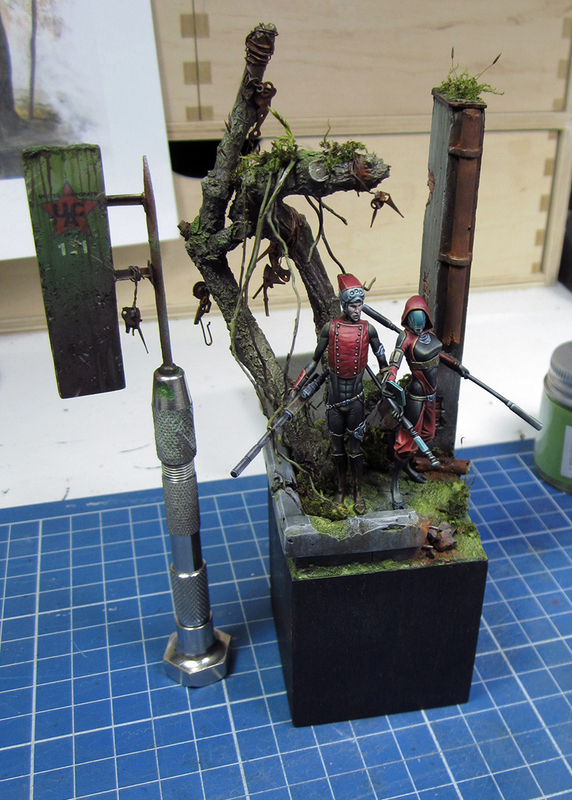 Even if it’s normal to “reduce” the painting aspect considering all the work to do behind the miniatures. 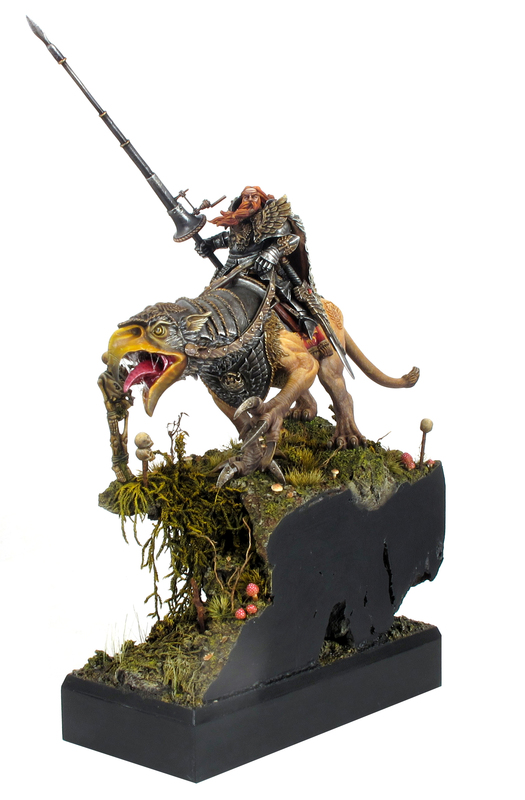 I also have to point, that, Raffa won the Best miniature 2011, was finalist in 2012, and is again on tracks for 2013. Really, Raffa is in my opinion, one of the very few crazy guys in this tiny miniatures world that is ours. And this piece is crazy without any doubt. It’s just difficult to make the balance between the technical aspect that makes this piece so “Woooowwwww”, and the only “miniature” aspect. 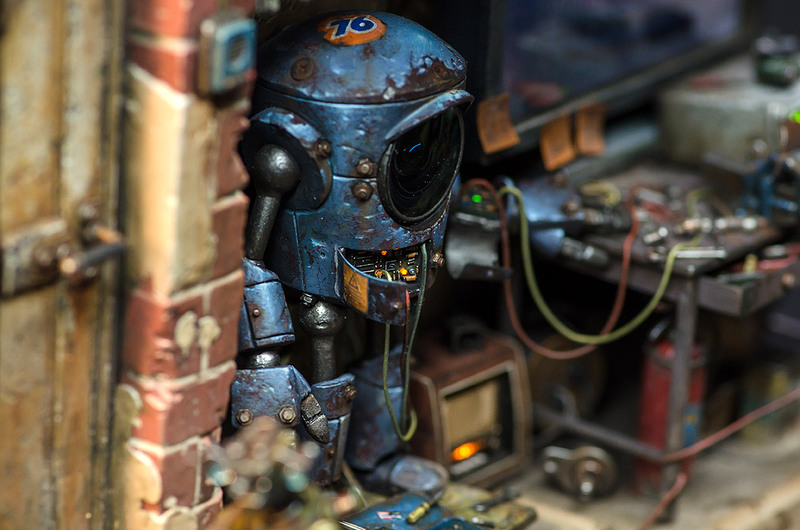 - The pixie : have an incredible painting level. 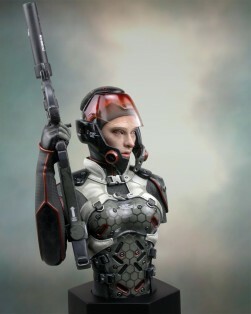 And I love the cartoonish sculpting style of Valentin Zak. All the colors works together, the base is very well done. All is very well balanced. The only thing, is that’s maybe less ambitious than the others, and less charismatic. 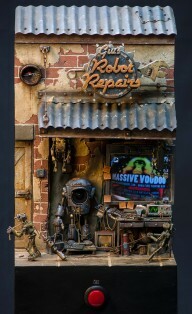 But this is normal, as it’s a commercial painting, on a miniature design to be sell. Yep you read it well. This is a studio paint job. Damned ! It’s in fact, a master work from the sculptor, the painter, and the company, to propose such a quality in the end. 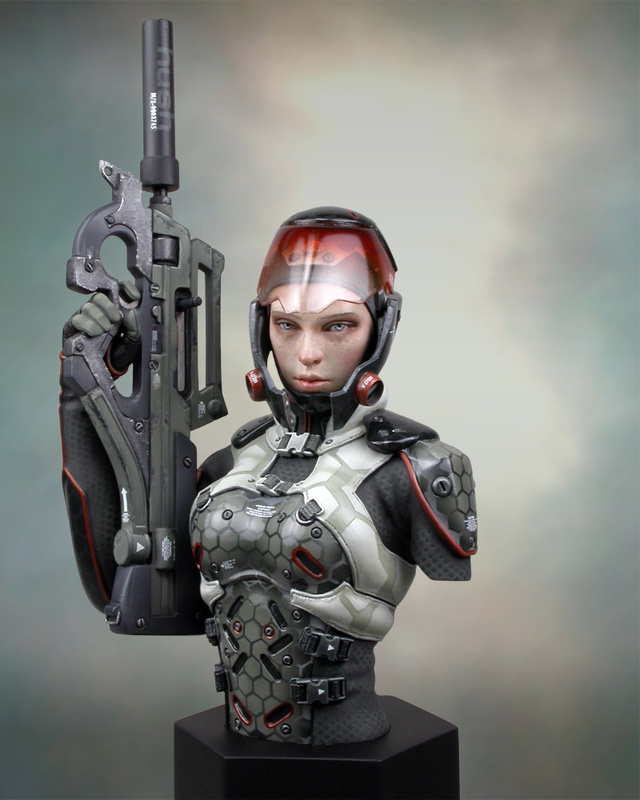 - Hush : is a fantastic sculpt, have a very nice design, and the creative process showed during the step by step was impressive. All is crazy about it. 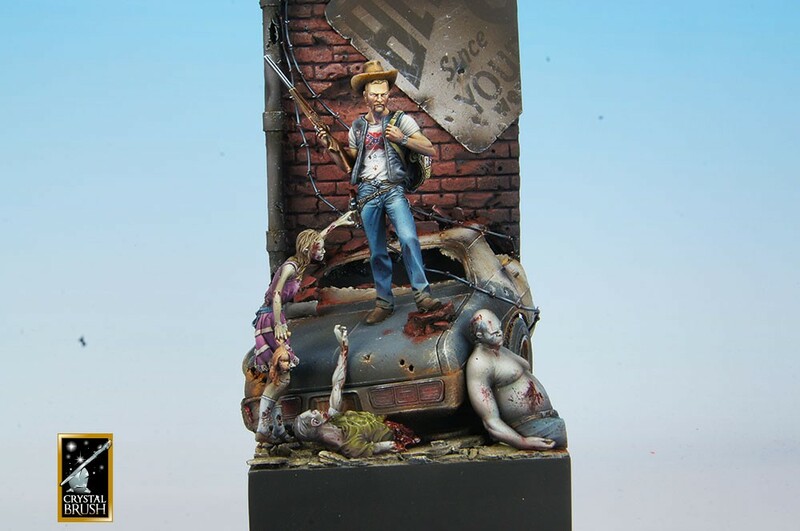 Miniature of the year 2013 : HUSH by Chris Clayton. Congrats to Chris Clayton for this fantastic bust, that’s a wonderful sculpt with a very ingenious painting. Chris is knowed for his skills, but definitly, he won the point with this project. Don’t forget to take a look on the step by step he made about it. UK text : The last “best of the month” about last year, 2013. 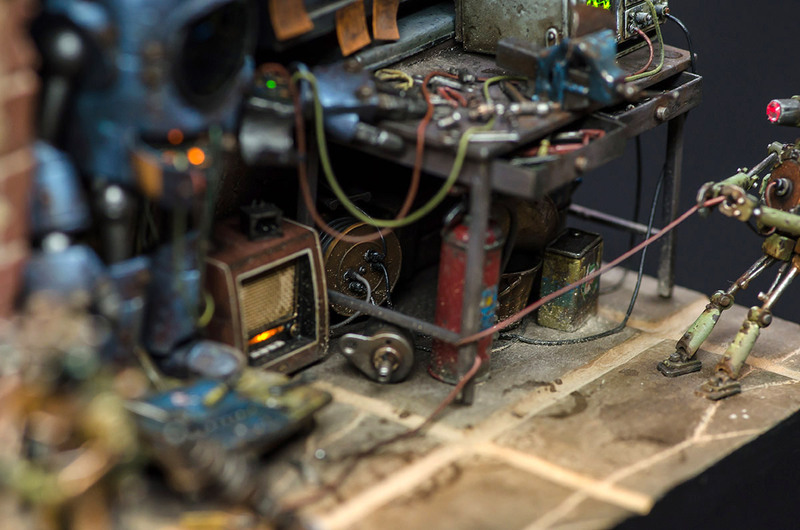 It’s a very technical diorama that deserved the last month award. 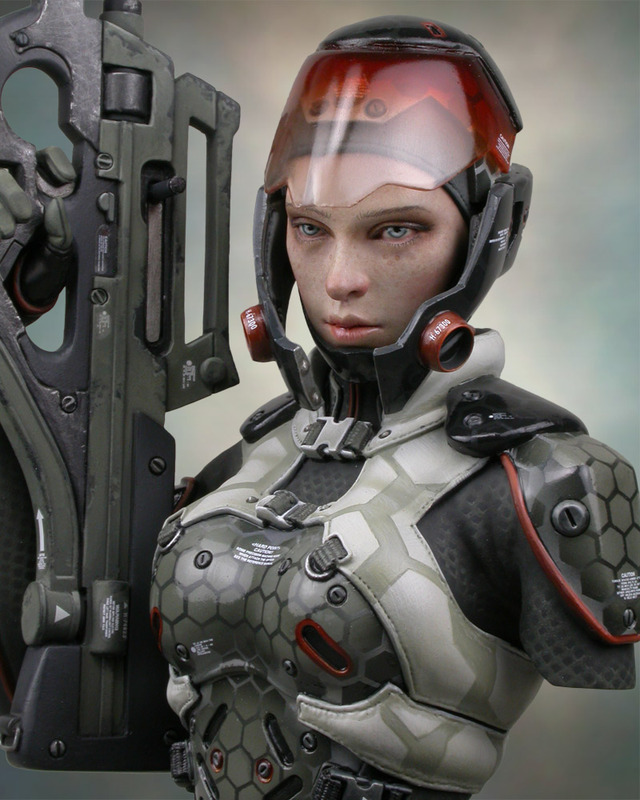 Congrats to Michal Pisarski aka Lan Studio, for this incredible and smooth piece. Texte FR : Le dernier “best of” concernant l’an passé, 2013. 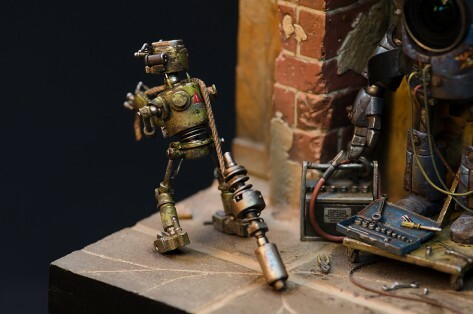 C’est une diorama extrêmement technique qui remporte la palme. Bravo à Michal Pisarski aka Lan Studio, pour cette pièce très propre et pleine de force. Voici une chronique publiée dans le numéro 65 de Ravage. À l’époque, seules les rumeurs de l’annulation du GD français et espagnol 2013 avaient court. Depuis, ces derniers ont bien été annulés, et les bruits qui courent concernant 2014 ne sont pas des plus joyeux, puisque seul le GD UK serait maintenu. Une page semble se tourner, mais voilà les quelques lignes écrites, alors que ce concours existait toujours un peu partout en Europe. S’il y a bien une question que l’on me pose souvent, c’est bien celle-ci : « comment fait-on pour gagner un Golden Demon ? ». Systématiquement, elle me renvoie des années en arrière, alors que j’étais aussi à la recherche d’une réponse. Notre microcosme est constitué de bien des choses, qui vont de l’apparition de nouvelles marques, de nouveaux systèmes de jeux, aux figurines elles-mêmes. Mais que l’on soit peintre ou joueur, les concours et tournois ne nous sont pas inconnus. En matière de peinture, il est clair que le Golden Demon (organisé par Games-Workshop) reste le concours de prédilection pour une large majorité. Mais pourquoi est-il devenu si populaire ? La réponse est simple, la firme anglaise possède un atout majeur que ses concurrents n’ont pas : White Dwarf. Dès que les résultats du GD anglais parurent dans le magazine, une envie naquît dans le cœur de tous ses lecteurs. Celle de voir ses figurines publiées, vues par le reste du monde, et de recevoir une statuette qui allait devenir mythique. 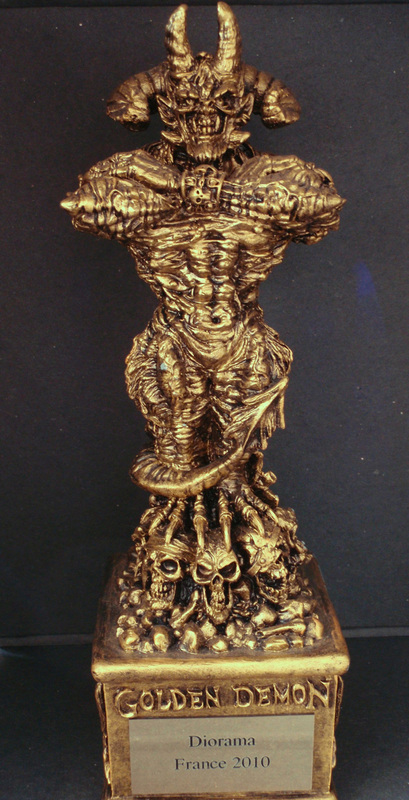 Pourtant, alors que le concours se répandit à travers le monde, avec des éditions américaines et européennes, et que le niveau grandissait, gagner un trophée du Golden Demon n’est pas si difficile. Avec du travail, beaucoup de remise en question, des discussions et en soumettant sa pièce à la critique, il devient dès lors rapide de progresser. Adolescent, je souhaitais véritablement acquérir l’une de ces statuettes. Sans jamais vraiment essayer de sortir du niveau que je donnais à mes armées. Après un an de pratique un peu plus intensive, je finis par décrocher le sésame en 2004, lors de l’édition allemande du concours. Aujourd’hui, j’ai perdu le compte de mes amis et proches du milieu qui y sont aussi parvenus. Chacun pour les raisons citées plus haut. Et, en moyenne après une à quatre années de travail. Une chose joue énormément cependant. En se déplaçant à différentes éditions au cours d’une année, on augmente grandement ses chances de repartir avec un trophée. Le niveau d’une même catégorie variant amplement d’une année sur l’autre, et d’un pays à l’autre. S’y ajoute que nombre de catégories sont plus accessibles. Gagner en « escouade » étant souvent bien plus aisé qu’en « figurine individuelle » ou « monstre ». Et puis, il faut aussi aborder les chiffres. Avec une moyenne de douze catégories, trois prix pour chacune, et avec les éditions internationales, ce sont plus de 250 trophées qui sont remis chaque année. Sachant que neuf ans se sont écoulés depuis mon premier démon, pas loin de 2300 statuettes ont été remises à travers le monde. Finalement se sont plusieurs centaines ou milliers de peintres, qui possèdent un bout de résine sur une étagère. Or, le Golden Demon existe depuis les années 80 (bien qu’il n’y avait pas autant de catégories, ni d’éditions qu’aujourd’hui). Le total est donc bien plus important. Enfin, même si beaucoup trouve le niveau extrêmement élevé – et cela fut mon cas – il faut malgré tout rationnaliser. Le niveau général présent parmi la dizaine de finalistes pouvant prétendre au podium d’une catégorie, dépasse rarement le niveau des tables « confirmés » des concours Open. Bien qu’il y ait plusieurs pièces d’exceptions à chaque édition. Certes, ce dernier n’est pas non plus enfantin à atteindre, mais avec une pratique continue, en lisant des tutoriels, et en soumettant son travail, il s’agit d’un niveau de pratique atteignable pour tout un chacun. Et je vous le jure, dès que la machine est en marche, que les réflexes sont acquis, progresser vers des résultats encore plus importants devient alors logique. Il n’y a donc rien de surprenant à ce qu’au bout de deux années de peinture studieuse, et pour peu que l’on se rende à deux (ou trois !) éditions, le sésame finisse par atterrir entre vos mains. Et c’est tout le bien que je vous souhaite ! Mais ce n’est pas tout. Il y a souvent une seconde question qui suit la première. « Qu’est-ce que cela change de gagner un Golden Demon ? ». Eh bien, honnêtement, cela n’apporte rien, si ce n’est un plaisir personnel. On ne devient connu que de ceux qui s’y intéressent. Et c’est tout. On ne devient pas riche en tout cas. Ce n’est pas parce que l’on gagne un ou cent démons, que ceux cherchant un peintre pour des commandes, viendront toquer à votre porte. J’ai trente trois démons et ne fais pas de la peinture de figurine ma profession à temps plein (pour le moment, même si cela est en train de changer). Certes, je ne communique pas particulièrement. Mais que l’on ait un démon ou pas, si l’on fait état de sa disponibilité concernant les commandes, et que l’on fait du bon travail : tout arrive alors de la même façon. Le démon à la limite, peut faire office de gage de qualité. Et encore, de part le nombre de trophées distribués, et leurs degrés de difficultés d’obtentions, cela n’est pas si véridique. Cela n’interpelle pas non plus les sociétés. Ce n’est pas le nombre de trophées qui importe, c’est bien votre travail général. Je sais que les offres qu’on m’a faites viennent de mes réalisations, plutôt que des « presse-papiers » en résine accumulés. Gagner un Golden Demon ne vous apportera donc jamais gloire, femme, et culte d’adorateurs prêt à provoquer la fin des temps… Quoique ? Cependant une chose est immuable. Vainqueurs ou pas, en participant à un concours vous aurez donné le meilleur de vous-même. En cherchant à vous améliorer, le résultat vous conduira forcément à être fier de vos efforts, de vos progrès, et de votre figurine. C’est personnellement là que je trouve plaisir à participer au GD. En plus de la deadline, qui force à finir un projet dans un temps imparti, cela m’a toujours forcé à m’améliorer et être satisfait des quelques progrès accomplis. La notion de compétition, pousse vers un accomplissement personnel. Bien sûr quand on participe à une compétition, on cherche à remporter un prix. Le fait d’en gagner un ne provoque qu’un plaisir immédiat. Alors, si vous cherchez à remporter un démon (et je vous le souhaite vraiment), en plus d’y parvenir à force de travail, vous vous rendrez surtout compte du chemin parcouru. Et c’est bien là le plus important : avoir pris de plus en plus de plaisir à peindre son petit bonhomme et à essayer de nouvelles choses. I let you with a pretty decent person… ! Sur ces mots, je vous laisse en charmante compagnie ! 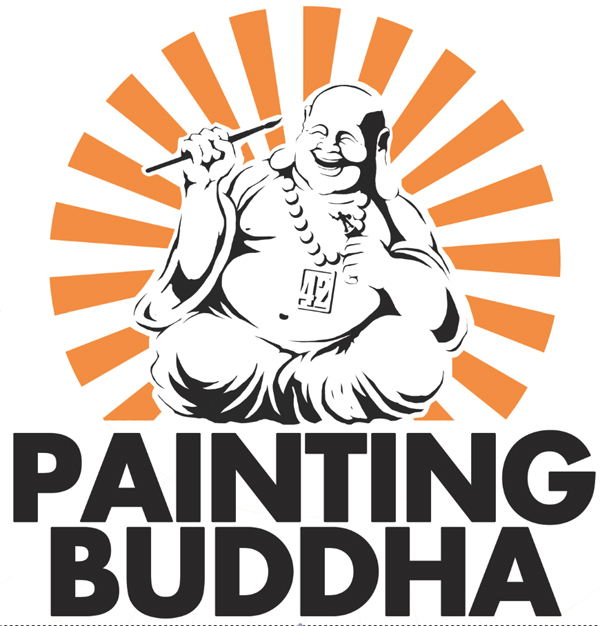 « Painting Buddha » est une gamme de produits, lancée par la société allemande Manabu. Cette nouvelle marque a pour projet d’éditer diverses figurines, mais aussi toute une gamme de tutoriels de peinture en DVD. Le premier de cette série est sorti cette année. Jusque là, une nouvelle marque de DVD de peinture… rien de nouveau. Oui mais non ! Car on est là face à un produit dont le concept et la qualité sont tout à fait inégalés. La gamme « Painting Buddha » se résume en un mot : qualité. Michael Bartels (voir encadré) aime les produits aux belles finitions, et cela se ressent. Pour ce premier pack de la saison 1 (la société prévoit en effet de produire plusieurs DVD par an), deux formules sont proposées. L’une au prix extrêmement attractif, la seconde tout autant aux vues du contenu additionnel. Ainsi de quoi parle t-on ? Eh bien d’un concept simple, mais qu’aucune marque n’avait pensé à réaliser. Proposer des DVD de tutoriels, en fournissant les figurines avec les vidéos. Ainsi, le spectateur dispose réellement de ce qu’il voit à l’écran, et peut surtout, appliquer en direct les conseils qu’il reçoit. 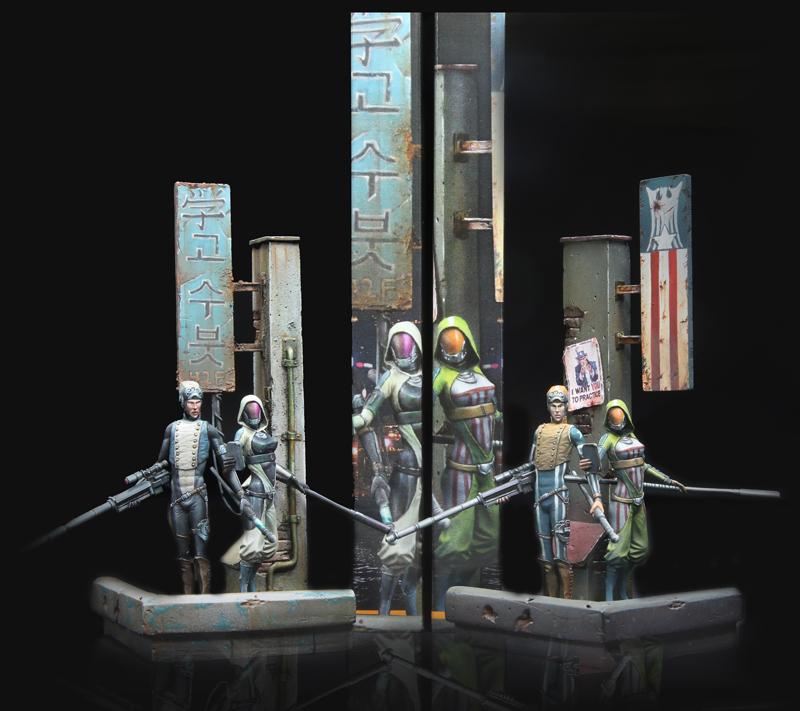 - Pour 42 euros, l’édition « simple » (Budget box) offre deux très belles figurines 54mm exclusives (deux assassins : Brad et Yanet, sculptés par Mati Zander), l’ensemble dans une boite métallique de très belle facture… et six DVD totalisant un peu plus de 15h de vidéos ! Relisez bien la ligne précédente. Dans le commerce, rien que deux figurines (en résine qui plus est) 54mm coûtent plus chères que le prix de ce pack. Or, en plus de ces deux pièces (dont le moulage est impeccable) vous avez en prime un sublime set de tutoriels, administré par rien de moins que Ben Komets (3 Slayer Sword) et Rafael Garcia Marin (12 Golden Demon) ! - Pour 84 euros (Supporter box), vous obtenez en plus de tout ce que j’ai déjà cité, un coffret collector aux allures de produit de luxe issu des grandes parfumeries françaises. J’en rajoute vraiment à peine. Le packaging « tue » littéralement. Le boitier DVD (déjà d’une qualité similaire aux boitiers collector de vos plus belles séries), se trouve inséré dans un coffret aux finitions dantesques. S’y ajoute un T-Shirt (à la taille désirée), un livret sur la préparation des figurines, un livret sur la présentation de la société, un certificat d’édition limitée, et tout un tas de petits goodies (stickers, magnet, badges). Sans parler de la lettre de remerciement, personnalisée et signée. Pour finir, en commandant ce format, vous pourrez avoir la chance de découvrir un ticket supplémentaire de bronze, d’argent ou d’or. Et alors… ? Eh bien sachez qu’avec le ticket « Or », vous pouvez carrément remporter un cours privé de trois jours pour vous et un de vos amis, à Berlin, avec Ben Komets et Mati Zander (le sculpteur). Le bronze offrant une « buget box » et l’argent une « Supporter box » de votre choix parmi les prochaines sorties de la marque. Vraiment, on sent qu’on en a pour son argent. On est même heureux de voir le sérieux et le côté « proche» de la société envers ses clients. Il faudra dans tous les cas ajouter 10euros de frais de port, cher me direz-vous ? Eh bien non, car on reçoit un paquet avec suivi et assurance. Le top jusqu’au bout. D’autant qu’en cas de soucis, ou questions, le mail de la société est totalement ouvert, avec réponse rapide, détaillée. Manabu/Painting Buddha insiste même pour avoir le plus de retours possibles, afin d’améliorer ses futures sorties (et les rendre encore plus abordables ! ), en fonction des remarques que vous ferez. Je vais commencer par le seul point un peu dérangeant, pour nous français. Le coffret ne propose pas de sous-titres dans notre langue. Le tout est en anglais, avec sous-titre anglais, allemand et espagnol. Je dis un peu dérangeant, car très honnêtement, les sous-titres en anglais activés, le tout est très facile à suivre, et il ne faut pas être bilingue pour pouvoir comprendre. D’autant que la qualité vidéo est très bonne. Ceci dit, les prochaines sorties devraient proposer des sous-titres français. À la bonne heure ! 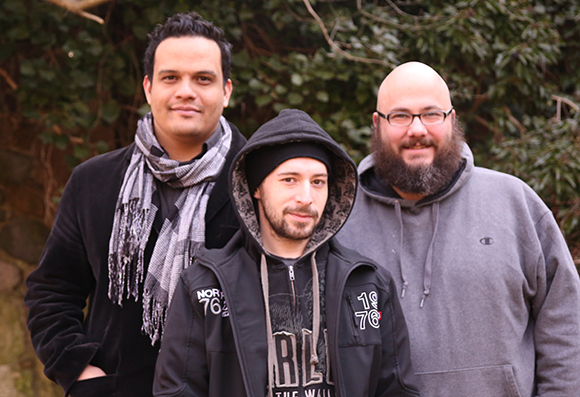 - OSL… et plus encore ! Par ailleurs, les schémas de couleurs des deux peintres étant totalement différents, la colorimétrie globale permet de voir le traitement de nombreuses teintes. Dont quelques unes souvent « méprisées ». Ben Komets fait ainsi la démonstration de la peinture de combinaisons noires, et de tissus blancs/beiges. Un régal pour ceux n’osant pas s’aventurer à ce genre de teintes. Désormais, ce ne sera plus le cas. Les techniques abordées vont clairement dans le sens de la peinture de concours. Et rien n’est laissé au hasard. Trois caméras sont utilisées. Une centrée sur la figurine, l’autre sur la palette, et la troisième filmant le peintre, permettant de le voir parler (de face) à divers moments de la réalisation. Sur 15h de vidéos, on voit chacun des peintres, traités les deux assassins que la marque propose et leur décor. Et surtout Brad et Yanet sont systématiquement peints de A à Z. Rien n’est éclipsé. S’il y a forcément quelques redondances ; NMM chez Ben, NMM chez Rafael (il aurait d’ailleurs été mieux de proposer NMM et TMP)… il est surtout très intéressant de voir que chacune des parties de la figurine est abordée. Long à regarder, avec des redites de surfaces, mais drastiquement utile pour le peintre, ayant la figurine sous les yeux (ou sous ses pinceaux). Cela offre un guide pour chacune des surfaces. Il est très agréable de voir le tout du début jusqu’à la fin. De plus, il est important de noter la différence de style des peintres. Ben progressant zone par zone selon ses envies (en commençant par le visage néanmoins) et fait tout au pinceau. Là où Rafael use aussi de l’aérographe, pose toutes les bases sur ses figurines, et peint du haut vers le bas (en terminant presque par le visage). La manière de « donner cours » est aussi différente. Si Ben est plus technique et sobre, Rafael offre beaucoup plus de conseils théoriques. Et les différences ne s’arrêtent pas là. 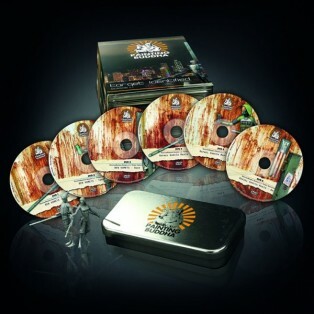 Le contraste entre les deux apporte ainsi une véritable personnalité à ce set de DVD. Notons aussi que la réalisation est très « carrée ». Professionnel dans le cadrage, la prise de son, la réalisation des menus, le sous-titrage… cela fait plaisir ! Cependant, les auteurs ont aussi su laisser passer, au montage, des petits moments de détente, de blagues sur le tournage, ou quelques petites choses comiques dans le sous-titrage (comme le doublage du sèche-cheveux). Bref un ensemble très complet et que je recommande sans réserve. La barrière de la langue sera bien évidemment un problème pour certains. Mais réellement, un minimum de connaissance en anglais vous ouvrira la porte de 15h de vidéos et de tutoriels sans trop de problèmes. Et la peinture des figurines en elle-même vaut le coup d’œil. Le prochain DVD sera à nouveau tourné vers le 54mm. Un diorama, une demoiselle, et pleins de bits en tout genre ! Par ailleurs, une autre sortie (un peu plus éloignée) devrait aborder un sujet trop peu, voire pas du tout vu, à savoir le traitement d’un véhicule (disponible encore une fois avec les DVD, et qui apparemment, sera compatible avec plusieurs armées d’un célèbre jeu futuriste, dont la société se trouve à Nottingham… :D). Gageons du coup qu’une version sous-titrée FR sera de la partie, pour assurer un succès (mérité) au sein de l’Hexagone. Sans équipe et sans travail, pas de résultats. Painting Buddha est composé de trois personnes : Michael Bartels, Ben Komets et Mati Zander. Plus que cela, la société se veut créatrice de produits de très haute qualité au prix le plus abordable. Mais surtout elle reverse la plupart de ses profits à la communauté et à des œuvres de charité. - 16% pour la charité. Sur ces 16%, huit sont reversés à « 1Love », organisation supportée par la famille Marley. Les huit derniers pourcents étant laissés à diverses propositions et projets dont le choix est réservé aux clients. C’est à dire à VOUS. Pour avoir un peu échangé avec Michael Bartels, le tout est sincère et cela fait plaisir de voir une équipe de passionnés aux commandes, cherchant à amoindrir le plus possible les coûts pour le consommateur, en produisant la plus haute qualité, et en redistribuant le plus possible pour faire profiter la communauté. Je souhaite donc une belle et longue route à cette équipe ! 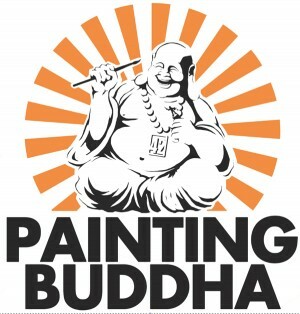 http://www.paintingbuddha.com/ : Le « shop » de la société. 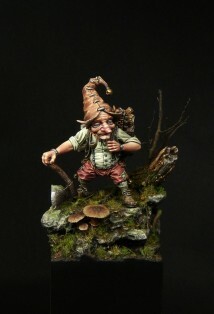 http://www.masterminis.blogspot.fr/ : le blog. On y retrouve des informations sur Painting Buddha, mais aussi tout un tas d’analyses et de sujets pertinents sur l’actualité du monde de la figurine. Ainsi, que quelques rumeurs croustillantes sur les futures sorties d’une marque anglaise bien connue, souvent bien avant que celle-ci n’en parle ! UK Text : New miniature on the desk. This one will be take on Ebay before the end of the month. And I’ll to do my best with regular WIP pics. The plot is to try making the miniature full NMM or NMM-like. We’ll see if I sustain the effort (or not ), as I’m pretty much more a TMP painter. 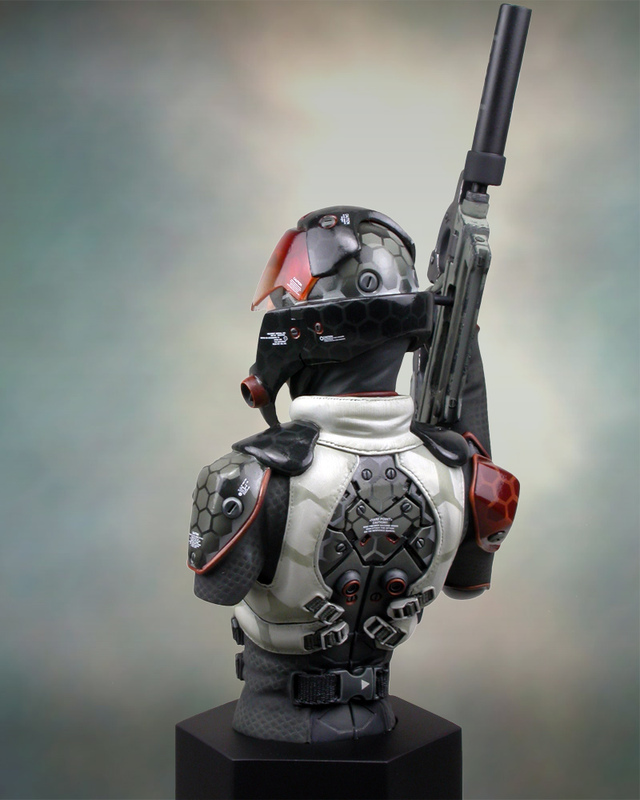 Texte FR : La dernière figurine en date sur le bureau. Celle-ci sera donc mise sur Ebay (normalement) avant la fin mois. Je vais aussi essayer, le plus possible, de poster des photos du WIP. Le truc, c’est d’essayer de faire la figurine tout en NMM, ou simili-NMM. On verra si je tiens jusqu’au bout (ou pas ), vu que je suis bien plus proche de l’école TMP. UK Text : Ok… the next Best of the Month should not be a surprise for anyone. It’s just a wonder of creativity, idea, technology, and painting of course. This piece is just a slice of happyness, and I really hope to see it one day and enjoy it. 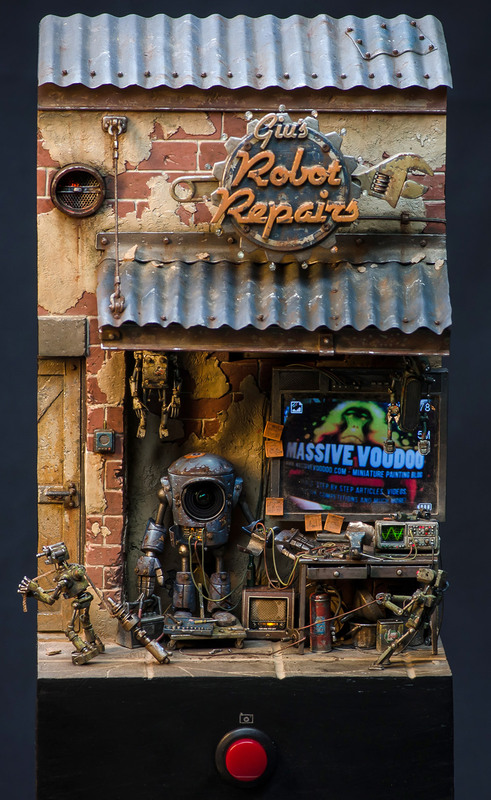 Congrats mister Pictser, aka Raffaele Picca, again, for your craziness and work ! Texte FR : Ok, le prochain Best du mois ne surprendra personne. C’est une merveille de créativité, d’idée, de technologie et de peinture, bien évidemment. Cette pièce est comme une tranche de bonheur, et j’espère vraiment pouvoir la découvrir et l’apprécier un jour. Bravo à mister Picster, aka Raffaele Picca, encore une fois, pour son travail et ses idées démentielles. UK text : Hi everybody ! Ok I’m quite in a hurry. Yesterday we painted with Juan to a pretty late hour, and it was not the time for pics. So just find 5 minutes before leaving to upload this picture. I just need to make rust on the sign, finish the strikes, and glue it, and it’ll be FINISHED ! As I’ll probably not have Internet in Antibes, it’ll be the last post before next week. I guess. So see you soon ! Texte FR : Salut tout le monde ! Ok je suis grave à la bourre. Hier on a finit super tard avec Juan, et il n’était plus l’heure pour des photos. Là j’ai 5 minutes avant de partir pour la soirée afin de publier une petite photo. Il me reste juste à faire la rouille et affiner les trainées sur le panneau et le coller, et ce sera FINI ! Comme je n’aurai sans doute plus Internet à Antibes, ce sera le dernier post avant la semaine prochaine je pense !